David Felder discusses his work-in-progress, "Les Quatre Temps Cardinaux," his work as the Center's Director, and his many other projects as a composer. We recently caught up with the many activities of the Director of the Robert and Carol Morris Center for 21st Century Music, David Felder, who follows a very demanding schedule as Director of the June in Buffalo Festival, Artistic Director of the Slee Sinfonietta, and University at Buffalo Birge-Cary Chair in Music Composition. As a SUNY Distinguished Professor, David maintains a very active and highly regarded composition studio and keeps up a very impressive output of works as a composer. He has recently completed new works – Funfares, which was written for the inauguration of UB's President and premiered last September, and Nomina Sunt Consequentia Rerum, written for Harold Rosenbaum's New York Virtuoso Singers. We asked David about his recent projects, “I’ve been working very hard on a vocal cycle commissioned by the Koussevitzky Music Foundation, my second Koussevitsky I'm happy to say, which will feature bass singer Ethan Herschenfeld and soprano Laura Aikin, who starred as Lulu in the recent production of Lulu at La Scala. Joining them will be a good-size chamber orchestra of about 30 musicians from SIGNAL, as well as ten channels of electronics. Co-commissioners are the Slee Sinfonietta, and the Boston Modern Orchestra Project, who will also program the work in subsequent seasons and record it as well. The entire cycle is built on a central poem by René Daumal, Les Quatre Temps Cardinaux (The Four Cardinal Seasons), which is a seemingly simple unpublished poem Daumal composed late in his life that has to do with the seasons, the times of the day, nature, and the life cycle. I’m using other poems to complement the central poem that are of a more personal nature and are more located in a specific place and time than the Daumal verses, which are more transpersonal. Two of the more specific poems, Spring Light and Buffalo Evening, are by Robert Creeley who was a greatly admired former colleague here at UB. Also in the cycle will be a poem from a terrific poet named Dana Gioia, who used to be the head of the National Endowment for the Arts and is now a distinguished chair at USC. His work is entitled Insomnia, which will be one of the companion poems linked to various times of the day. I also include Full Powers, a poem from one of my favorite poets, Pablo Neruda. “An interesting aspect of the piece is that I have audio recordings of the poets reading their poems, and can use their voices as source material. Most of the readings will be substantially electronically transformed, though you’ll definitely be able to hear Dana Gioia’s voice. Often the phonemes from the spoken poems will be translated into instrumental analogues, or processed into bell sounds or other timbres. The texts will also be carried, to a large degree, by the singers. It’s been a really big project – projecting to be about 40-45 minutes and it’s about halfway done now in draft, with a lot of provisionary electronic cues and processing engines already made. I’ll be doing a substantial amount of work on it during the summer, as the premiere will be April 23rd, 2013. “This year has been particularly complicated because I had been asked to co-chair the University at Buffalo Provost search, which required a lot of time and energy. Plus, my composition studio is fuller than it has ever been with 13 Ph.D. students. I’m extraordinarily busy. It’s a very exciting time though. The Center is doing very well and we’re happy to have all of our major donors renewing their commitments. We’ve gotten to the point where we have to plan our activities about three years in advance, and we’re on the air in a very real way. Now it’s time to expand and formalize our activities and to broadcast more effectively what we do." You can stay abreast of David Felder’s latest recordings by checking in with Albany Records, who will be releasing a 90-minute portrait disc, on blu ray and in surround sound, by the summer of 2012. 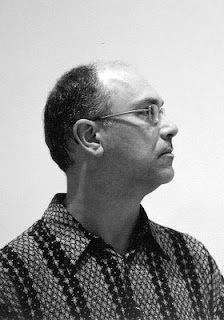 High quality audio samples of David Felder’s work can also be found here, and many of his scores have been made available online by the Theodore Presser Company, as well as the new score-publishing intitiative, Project Schott New York . Below is a strikingly beautiful excerpt from David Felder’s Chasmal, from Shamayim, a recent three-part music/video collaboration with video artist Elliot Caplan, featuring the virtuosic bassist Nicholas Isherwood. Maestro Dan Bassin debuts with the Slee Sinfonietta! The Robert and Carol Morris Center for 21st Century Music is delighted to present "UB Graduate Composers: PAST and PRESENT," a concert performed by the virtuosic Slee Sinfonietta next week on Tuesday, April 3rd, at 7:30 p.m. in Lippes Concert Hall. The program will showcase the finest recent works from UB composers, and feature an epic violoncello quartet from contemporary Russian composer Sofia Gubaidulina. Wielding the baton for the evening will be well-known friend of the Center and conductor of the UBSO, Maestro Daniel Bassin, who will be conducting the Slee Sinfonietta for the first time next week. Daniel Bassin has come to UB after having been awarded a prestigious fellowship with the Boston Philharmonic Orchestra and later working for five seasons with the American Symphony Orchestra in New York City. As a passionate advocate of new music, Daniel has led premieres and first performances of over 80 works, and has performed as a conductor and trumpeter in 37 countries. In 2008 he acted as assistant conductor for the Jerusalem Symphony Orchestra’s 16-city tour of the American West Coast and Midwest. 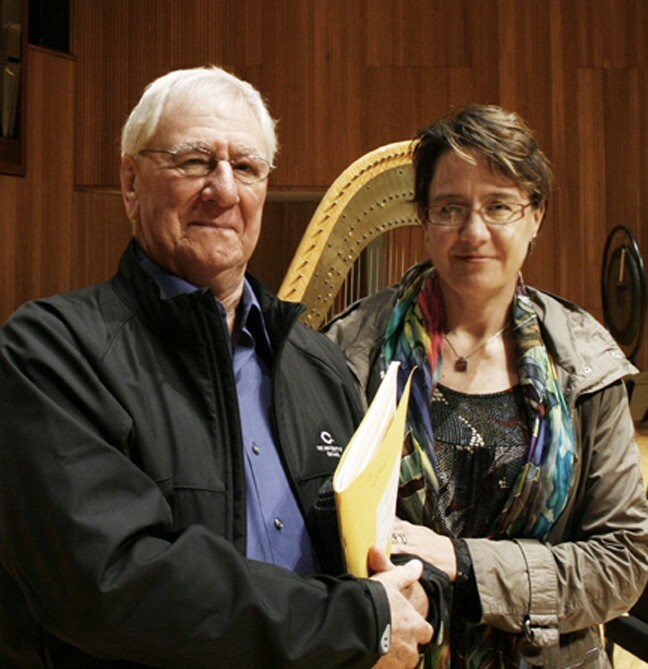 Maestro Bassin’s work with the UBSO was recently featured in an article in Buffalo’s Artvoice by Jan Jezioro, "A Musical Director With a Mission". 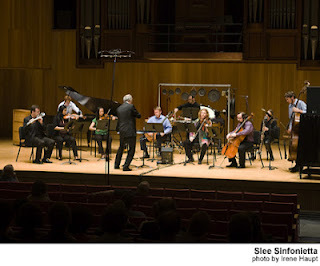 As a teaser for the upcoming concert, below is a video of Brad Lubman conducting the Slee Sinfonietta for a performance of David Felder’s Inner Sky, featuring guest flutist Mario Caroli. The Center welcomes the Antares New Music Quartet to UB! The Robert and Carol Morris Center for 21st Century Music is excited to be co-sponsoring a visit by the Antares New Music Quartet to the University at Buffalo on March 30th for an evening concert of some of the finest and most elegant music composed in recent times. We are also looking forward to the composer workshop the day before, on March 29th, when Antares will perform works by graduate composers selected from the University at Buffalo Department of Music. 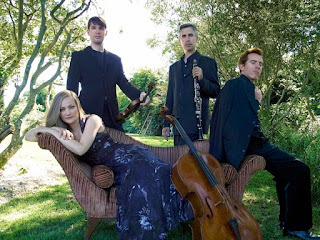 The Antares New Music Quartet includes violinist Jesse Mills, cellist Rebecca Patterson, clarinetist Garrick Zoeter, and UB faculty pianist Eric Huebner, who specialize in bringing to life contemporary musical works created by today’s living composers, as well as masterpieces from the immediate past. On Friday, March 30th, at 7:30 p.m. in Lippes Concert Hall, Antares will perform Roger Reynolds’ Shadowed Narrative, a recent piece that uses text written by author Gabriel Garcia Marquez as a model for assembling the individual voices of the ensemble into a complex conversation, with the instrumental phrases resembling the syntax and grammar of spoken language. The program will also feature Igor Stravinksy’s L'historie du soldat Suite, Paul Hindemith’s Quartet, and Maurice Ravel’s Trio for piano, violin and cello. Ticket information can be found at the Slee Hall Box Office. Zane Merritt, who comes to us after just completing a Masters degree from Butler University in Indiana, has a piece that will be performed by Antares titled Mixed Quartet No. 1 (breakdown), which includes intricate, interlocking rhythms, and tightly coordinated motivic gestures that develop, expand, and stretch throughout the piece, resulting in extreme rhythmic complexity and vibrant physical intensity. 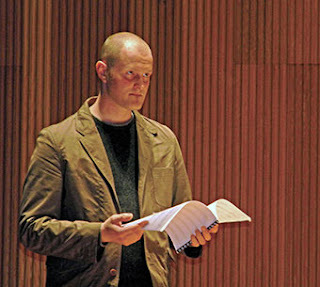 Zane says, “I was interested in pushing performers to the outer limits of rhythmic virtuosity so that the piece feels like it is on the brink of falling apart.” The composer workshop will be in Lippes Hall at 3:30 p.m. on Thursday, March 29th, and will be free and open to the public. The Antares New Music Quartet was originally created to perform Olivier Messiaen’s Quartet for the End of Time, which the composer, shockingly, composed and had performed while he was a prisoner in an internment camp under the Nazi occupation of France during World War II. Below is a video of Antares performing the seventh movement of the Quartet. Absolutely Gorgeous! Join us next week and throughout April for a celebration of John Cage’s music for his 100th birthday. University at Buffalo faculty and graduate students will be performing John Cage’s pieces at UB and around the city of Buffalo for the rest of the spring to honor the man who relentlessly pioneered and innovated in nearly all forms of art, including poetry, film, multimedia installation, theater, and performance art, as well as in a plethora of musical genres and compositional styles. The upcoming John Cage concerts will feature many of Cage’s myriad approaches to composition, and showcase pieces composed during all the various periods of his long and very productive life. 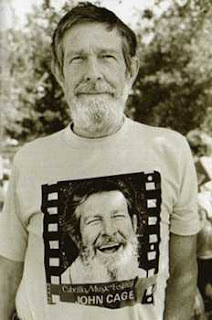 John Cage has long been a deeply respected friend of the University at Buffalo Department of Music, as he was a regular June in Buffalo Faculty Composer from as far back as 1975, a frequent collaborator with Lejaren Hiller, and close personal friend of UB Composer Morton Feldman. The celebration begins next week on Wednesday, March 21st, at 7:30 p.m. in Slee Hall with a free concert of the complete Sonatas and Interludes for Prepared Piano performed by UB Professor and New York Philharmonic pianist-in-residence Eric Huebner. The piano will be ‘prepared’ ahead of time with screws, bolts, pennies, weather stripping, washers, and pieces of rubber, wood, and bamboo, all strategically inserted and threaded into the piano’s strings. The score diligently maps out the placement of the materials within the piano strings to a quarter of an inch, catalyzing the many delicate interactions between the strings’ harmonics and the preparation materials and achieving an astonishing variety of textures and timbres. At the premiere of the Sonatas and Interludes in 1949, the critic for The New York Times wrote that the work, “left one with the feeling that Mr. Cage is one of this country’s finest composers and that his invention [the prepared piano] has now been vindicated musically.” Eric Huebner’s piano students will also showcase their talents throughout the evening and perform certain selections from the Sonatas and Interludes. The following week there will be a concert of John Cage’s early works at Buffalo’s Hallwalls on Tuesday, March 27th, at 8:00 p.m., presented by Tom Kolor and the UB Contemporary Ensemble. 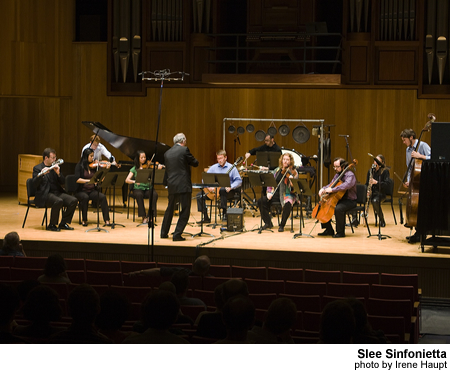 Some of the works to be performed include Sonata for Clarinet, Solo with obligato accompaniment, and John Cage’s very first percussion piece, Trio, which features Cage’s love for including atypical percussion materials such as wooden planks, bamboo, twigs, and an impressive assortment of drums and other percussion instruments. The birthday celebration will continue into April with an afternoon concert at Villa Maria College on April 19th, where UB percussionist Shelly Purdy will perform Cage’s indeterminate work 27’ 10.554”. The final concert in the John Cage series will be back at the University at Buffalo’s Slee Hall on April 24th and feature performances by UB Performance Faculty and the UB Contemporary Ensemble, check in next month at the Center’s website for details. Below is a video of Sonatas VII and XVI from the Sonatas and Interludes, performed by James Tenney at the Schindler House in 2002. The Robert and Carol Morris Center for 21st Century Music co-sponsors "A Musical Feast" featuring works by Rands, Carter, Heidelberger, Bacon, and Mozart. Here at the Robert and Carol Morris Center for 21st Century Music we are excited to be gearing up for the upcoming March 18th concert in the continuing concert series presented by “A Musical Feast.” Founded in 2006 by retired Concert Master of the Buffalo Philharmonic Orchestra Charles Haupt, “A Musical Feast” ventures to fuse contemporary and classical music with poetry and dance, and features internationally renowned musicians alongside Buffalo’s top performers and music-makers. For this upcoming concert at the Burchfield Penney Art Center, co-sponsored by the Robert and Carol Morris Center for 21st Century Music, we are particularly excited to be showcasing two world premieres from University at Buffalo composers Nathan Heidelberger and John Bacon, as well as works by Wolfgang Mozart, Elliot Carter, and long-time friend of the Center Bernard Rands. Opening the concert will be UB composer and percussionist John Bacon premiering his new piece, ...wind, water, metal, skin…, for flute and percussion. John Bacon will be joined by UB faculty flutist Barry Crawford for this premiere, which will feature a prepared vibraphone – John logged many hours experimenting and working with different materials (alluded to in the title of the piece) to doctor up the vibraphone and create an exciting blend of textures and timbres to dialogue with the many colors Barry Crawford is able to achieve with his virtuosic flute playing. John describes his thoughts about the work, "the piece started from the idea of wind chime melodies and the way that the notes combine into different orderings and repetitions, along with that is the idea of each of the materials in the title and how to express some of their properties through music. One final idea that is used is how the two players coordinate, sometimes very specifically, and other times, more casually." The other UB composer on the program, Nathan Heidelberger, will premiere his new work for soprano voice and piano, Descriptions of the Moon, a nine-part song cycle which sets a divergent array of texts on the topic of the moon from authors including Dante Alighieri, Galileo Galilei, James Joyce, Pablo Neruda, e.e. cummings, D.H. Lawrence, and Rainer Maria Rilke. 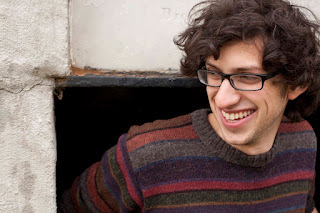 Nathan was recently interviewed by Buffalo’s radio station WBFO on his many recent activities: composing for the upcoming visit of the Antares Quartet, his regular performances with Buffalo’s multimedia improvisation group, Wooden Cities, his upcoming summer residency at the Aspen Music Festival, and his work with mezzo-soprano Julia Bentley, who will be premiering Descriptions of the Moon with UB faculty member and recently appointed principal pianist of the New York Philharmonic Eric Huebner. 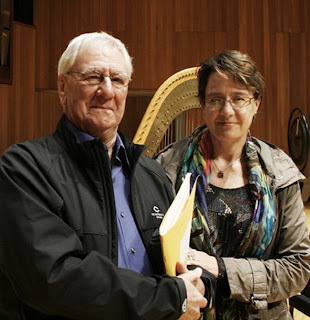 Julia Bentley will also be singing Bernard Rands’ Memo 7, for solo female voice, part of a series of short works for solo instruments Bernard Rands began back in 1971 with Memo 1 for contrabass. We were fortunate to have been visited last fall by Bernard Rands for a screening and discussion of his recent opera in two acts, Vincent, about the life and work of painter Vincent van Gogh. During his visit, Julia Bentley and the Slee Sinfonietta performed Rands' "Now Again"... fragments from Sappho, a collection of songs for voice and ensemble setting the poetry of the Greek poet Sappho. Audio from the concert can be heard on the Center's website. Eric Huebner will also be performing Elliott Carter’s work for solo piano Night Fantasies. Carter, who celebrated his 103 birthday this past December, describes the work as, "a piano piece of continuously changing moods, suggesting the fleeting thoughts and feelings that pass through the mind during a period of wakefulness at night... In this score, I wanted to capture the fanciful, changeable quality of our inner life at a time when it is not dominated by strong, directive intentions or desires." Carter’s Night Fantasies, which has been informally referred to as ‘an intense act of self-communion,’ will appear fittingly programmed alongside Mozart’s introverted and dark-hued K. 397 Fantasia in D minor, also to be interpreted by Eric Huebner. Join today. Advance tickets strongly recommended.